Programming is the start and can initiate with something as simple as a phone list of employees. M.Arch Architects defines architectural programming as the research and decision-making process that identifies the scope of work to be designed. Synonyms include "facility programming," "functional and operational requirements," and "scoping." Our approach is intended "to create a successful high-performance building." 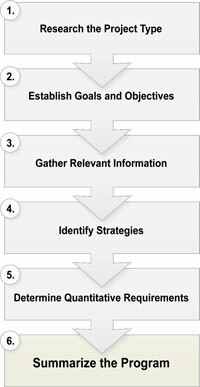 To achieve that goal, we apply an integrated design approach to each project during the planning and programming phases. People involved in the building design interact closely throughout the design process. The owner, building occupants, and operation and maintenance personnel should be involved to contribute their understanding of how the building and its systems will work for them once they occupy it. Identifying team member roles early is a key part to our process and if steps are taken to follow our methodology ownersexpect to exceed project expectations. Programmatic strategies suggest a way to accomplish the goals given what one now knows about the opportunities and constraints. 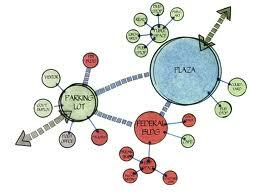 A familiar example of a programmatic strategy is the relationship or "bubble" diagram. These diagrams indicate what functions should be near each other in order for the project to function smoothly. Relationship diagrams can also indicate the desired circulation connections between spaces, what spaces require security or audio privacy, or other aspects of special relationships.